Note: In 2007, New Chauncey was “adopted” by WLPD Captain John Walker. The connection was helpful to both the PD and neighborhood and Chief Jason Dombkowski has continued the program with Lt. Sparger after John was redeployed to the Middle East. Gary is currently the coordinator for officer field training is certified by the Law Enforcement Training Board as an EVOC (Emergency Vehicle Operator Course) instructor. He has taught at the Indiana Law Enforcement Academy as well as Ohio’s academy. EVOC trains officers to drive safely in pursuits and other police driving situations or as Gary says, it good clean fun. West Lafayette Lt. Gary Sparger is the New Chauncey point of contact for the City Police Department. Gary and his wife have lived in the West Lafayette Wabash Shores neighborhood since 1999 and have two teenagers at West Lafayette High School. Gary has coached various sports including baseball, softball, and basketball and presently is teaching them how to drive. Gary is an avid reader and particularly enjoys books on American history. Gary enjoys travel, weight lifting, sports, and physical activity in general, and is a “pretty fair” bass fisherman. If you would like to talk with Gary, please feel free to call him during the day through dispatch at 765.775-5200, but email is the best way to reach him. NCNA: What are the areas of police work that interest you the most? Gary: I find that patrol work is the most rewarding for me. Patrol work should be the primary focus of any police department. More people have contact with our patrol division than any other part of the police department. I think it is very important and it has been the focus of my entire career. NCNA: Citywide, what enforcement areas is the WLPD focusing its efforts? In the New Chauncey area? Gary: We are currently focusing our efforts to control crime in our HUD housing areas. These areas have the greatest potential for violent crime in our city. In your neighborhood we are continually focused on quality of life issues. Vandalism and loud parties continue to be a problem. These problems require the constant attention of our patrol officers. NCNA:What additional programs would you like to see implemented here in West Lafayette? Gary: I would like to install red light cameras at some of our most dangerous intersections. Indiana law does not currently provide a mechanism for their use but, I think there is great potential to reduce the number of serious traffic crashes by utilizing this technology. NCNA: What is the biggest challenge facing your department today? Gary: Our biggest challenge at WLPD is maintaining our current level of enforcement while the budget continually shrinks. We have a pressing need to keep officers deployed in the Village bar area at night in order to reduce violence and vandalism. Petty crime left unchecked in the Village has a tendency to spread to the surrounding neighborhoods. During Purdue’s football season, WLPD expends a large portion of the overtime budget to control traffic, assign foot patrol to the village, and to assign general saturation patrol in the neighborhoods around campus. It is important that we continue our efforts in this area. NCNA: What is the best part of being a member of the WLPD? Gary:The best part of working for WLPD for me personally, is that I can have a constant influence in the livability of our city. I live here, too, and I want our city to be safe. I want all of our neighborhoods to be desirable places to live. Our schools are among the best in the state, and our neighborhoods should be, too. 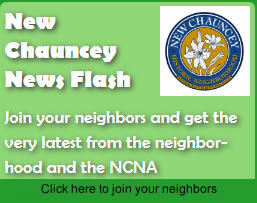 NCNA: Is there anything else that you want to share with the people in West Lafayette or the New Chauncey Neighborhood? Gary:WLPD is a small police department. We have enforcement challenges that require constant attention all over the city. Our citizens may be surprised to learn that WLPD patrol officers have removed more drugs from the streets of West Lafayette than the drug task force has in the entire county in some years. I have a positive outlook on our ability to continually check the influx of drugs and crime into our city. WLPD officers have a tradition of hard work and strict enforcement of the law. WLPD has a solid reputation with other departments in terms of enforcement activity and the quality of our officers. Our officers are dedicated, career public servants. Each one wants to do a good job and they rarely fail.